December | 2017 | LIT.GAZ. I last read this one in 1979! So, having completely forgotten it for so long, I wasn’t expecting much; how wrong I was. 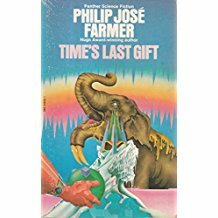 It’s a masterly series of linked short stories set in a project scanning the universe for communications from other civilisations, other intelligent species. The lives and work of the various characters are interwoven with thoughts and reflections on the possibilities inherent in there either being other life-forms somewhere else or on our species being alone; Gunn imagines contact is eventually made and also succeeds in making us care about his main characters and their work, in an astonishingly powerful and quite erudite novel. I’ve come across no other novels or stories by Gunn in my life of reading SF, so I looked him up; still alive in his nineties, apparently, and this particular novel a runner-up for a major award when it was published. Although life elsewhere is a standard trope of SF, the long and painstaking search for it, and philosophical implications are not. The novel was published in 1972, and this was the time when people like Carl Sagan were setting up the SETI project. The communication Gunn imagines from intelligent life in the Capella star-system strongly resembles the drawings and coded information we sent out from Earth on the Voyager spacecraft five years later in 1977. To me, science and research has always been a double-edged sword; to be sure, we advance the sum of human knowledge and understanding, and this is a good thing, but so much that is discovered can be and has been perverted to evil ends, either in the development of weapons of mass destruction, or tools that enhance our lives whilst wrecking our environment. Against this background, I’ve always felt that the exploration of space and the search for life elsewhere is one of the best things that we do, one of the most useful things on which we can expend time and resources; I’ve never felt it to be a waste of money, given the obscene size of the ‘defence’ budgets of so-called civilised nations… And, when I find myself reflecting on the fact that I won’t be around for ever, one of the things I realise I would really like to be around for would be when we finally contact other intelligences, or when we get to Mars. I still rate humans landing on the Moon as the greatest event of my lifetime. Nuclear war has devastated the Eastern US, where the story is set; little or nothing is known of further afield. Mutations are rife, among humans, animals and crops, and in the region where the story is set, formerly north-eastern Canada, are seen as punishment for man’s sins that led to the ‘Tribulation’ some three centuries ago, and in this fundamentalist Christian society are ruthlessly extirpated and destroyed. 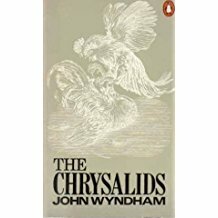 Wyndham writes well, and his story has a leisurely pace, fitting the sort of times and paces he’s creating; his master-stroke is his careful choice of an adolescent as his narrator, and one who gradually comes to realise that actually he carries a mutation, along with a handful of others nearby. It’s not a visible one, however – it’s a form of telepathy and ability to read and tune into the thoughts of others similarly affected. This puts them in considerable, though not immediate danger. Another book bought twenty years ago and not yet read… and I can see why. Just a bit of tidying-up in my SF collection and this pot-boiler from late in the writer’s career can definitely go. He still has a bee in his bonnet all those years after The War of the Worlds. The narrative style irritates, for a start: that of a slightly superior parent talking patronisingly to a child. And then there’s the plot – or total lack of it, for it’s no more than a series of conversations, that grow ever more didactic, and insane. It’s the story of a rather dull bourgeois man, who grows up questioning the world as a boy – as most children do – and this spirit is inevitably squashed out of him by all the usual pressures: growing up, study, work, family and so on, turning him into a conformist like everyone else. But, if you have reached this point thinking, why is lit.gaz wasting time even writing about such tosh, pause for a moment and reflect that Wells hasn’t completely lost the plot: there are several quite clever twists in the thinnish plot. Researching his crackpot thesis, he meets schoolchildren – whom he suspects of being changelings – who are exactly the same as he was at that age; we make the connection, even if our hero doesn’t, right until the very end of the novel, when he is about to crack up. It’s not a good book; it was a waste of eyeball time, as I like to put it. And yet, the Wellsian prescience is still there, and the notion of our limitations as a species is stronger now than eighty years ago, I think.